The challenge was simple. To reverse the increase in beer duty, which is set to rise by 3.4% in the Autumn Budget and then every year for the foreseeable future. 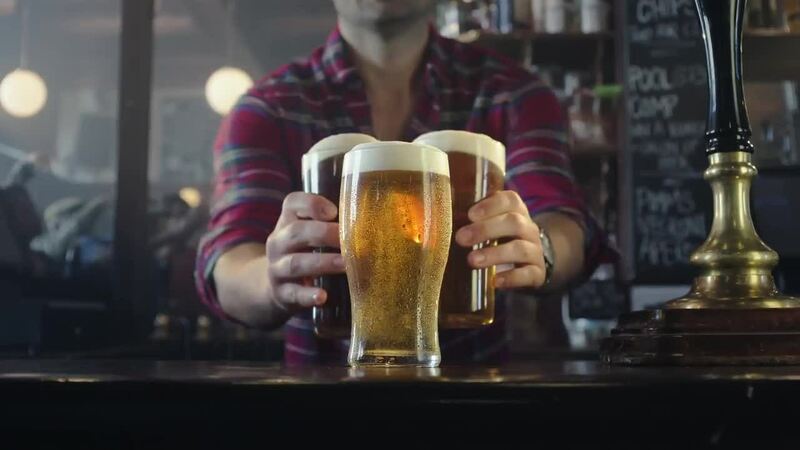 A rise that poses a serious threat to Britain’s Beer Alliance (BBA) and the prosperity of its 120 members, including founding global brewers AB InBev, Carlsberg, Heineken and Molson Coors. Long Live The Local. A grassroots and top down approach to campaigning. Engaging the heart to drive action and affect positive change. Giving small businesses a platform to celebrate their contribution to communities, culture and society-at-large. Stopping closures and preventing the planned rise. So why should beer tax be cut? Between 2008 and 2013, the industry experienced the devastating impact of a five-year escalator policy on beer duty. Beer sales declined by 24% in pubs, some 5,000 pubs closed and 58,000 pub and brewing related jobs were lost. But to convince Philip Hammond and other MPs that any rise in beer duty will be an incredibly unpopular decision, we had to create national groundswell. Previous arguments about taxation has failed, so it was time to take a different strategy. Research showed The Chancellor is not swayed by traditional lobbying campaigns – we needed to make people, not politicians, our primary target audience. Whilst the argument was plain to see, this could only take us so far. In order to get to grips with the task in hand - we delved even deeper to uncover the real story about pubs and small businesses – and what it means to the locals. These were the ones feeling the squeeze from beer duty. The planned rise we calculated would cost these pubs an additional £125m per year. Each would pay approximately £44k before they even opened their doors. This was without doubt the biggest challenge they faced right now, threatening their very survival. Pubs have been a constant in British life for generations and are now one of the few remaining truly open public spaces. They have been at the heart of our communities since they first opened their doors. Our own research conducted by YouGov revealed 78% of Brits think pubs are an important part of the local community. It was apparent from this research that we needed to create a campaign and movement that would engage the heart, the head and the hand. Or in other words, a campaign that made people feel, provided the ammunition to justify the cause and made it easy for them to act. The architecture of a modern movement. HEART: Make it emotional. And personal. Research told us a few pence off a pint would not motivate people to take action. So, we reframed the problem, positioning beer tax as a direct threat to the Great British Pub. We set about creating a movement all pub-goers and pub-owners could rally behind – giving the general public a reason to care. HEAD: Give people ammunition to justify the cause. In our consumer research, one stat won overwhelmingly: “Each day, three pubs close their doors for good”. This one sentence created real jeopardy. Research also gave us our supporting messages. HANDS: Make it easy for people to act. This is a direct response campaign. We needed as many people as possible to sign a petition and write to their MP. To drive the behaviour we wanted, we had to make the process of responding easy. And the ask needed to be clear. From this point, we landed on our strategic proposition, It’s Bigger Than Beer. A proposition that rang true because beer is more than just a commodity. Because pubs are more than just drinking establishments. They are a way of life. An intrinsic part of our national identity, playing an intrinsic role in modern British life. From this was born the campaign idea, Long Live The Local. An idea that celebrates the life and vitality, and the role that the local pub plays. One that doubles up as a call-to-action and a celebratory toast to everything the pub represents. A shorthand graphic tied our integrated campaign together. A symbol of resistance. A marker of urgency. Our pint glass turned exclamation mark became AN ICON FOR OUR MOVEMENT. A clear, simple call to action: SIGN THE PETITION TO CUT BEER TAX. ‘Long Live the Local’ launched in July 2018. Each execution delivered under our “Heart.Head.Hand” strategy, and across all communications the positive role that local pubs play in our lives, in villages, towns and cities up and down the country, was shown. 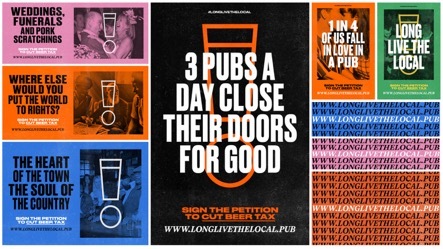 The campaign was purposefully designed to drive traffic to the website, www.Longlivethelocal.pub which is where consumers could sign the petition to reject the planned increases in beer duty and send a letter to their local MP at a click of a button. Converting emotion into action, a core strategic aim of the campaign. To maximise impact, we timed our communications with two major peaks in spend; immediately before – and then immediately after - Parliament’s summer recess. With the support of Havas Media, we used highly targeted media to ensure MPs overheard the campaign. Fifteen thousand in-pub activation kits were created, comprising beer mats and posters, which were all accessible through the website. These complemented the range of social and digital collateral which were available to both consumers and the industry alike, to generate further support and create groundswell. The all-important lobbying element kicked in over the summer, targeting marginal seats in and around the UK, with a big presence at both the Labour and Conservative Party conferences before a final Westminster Tube takeover and PR push to overturn the planned rise. ‘Long Live The Local’ is a grassrooted and top down approach to campaigning. It engages the heart to drive action and affect positive change. Giving small businesses a platform to celebrate their contribution to communities, culture and society-at-large. Stopping closures and preventing the planned rise.